The Brainerd Police Department will be holding its 15th Annual Halloween Safety Event on Wednesday, October 31st, from 3:30 to 6:30 p.m. Children are invited to Trick-or Treat and meet McGruff the Crime Dog in the garage on the north end of the police department, which is located at 225 East River Road. There will be several trick-or-treat stations with glow necklaces, Trick-or-Treat bags, tattoos, candy, and stickers. We are a proud supporter of the “Teal Pumpkin Project®” and will have non-food treats available. 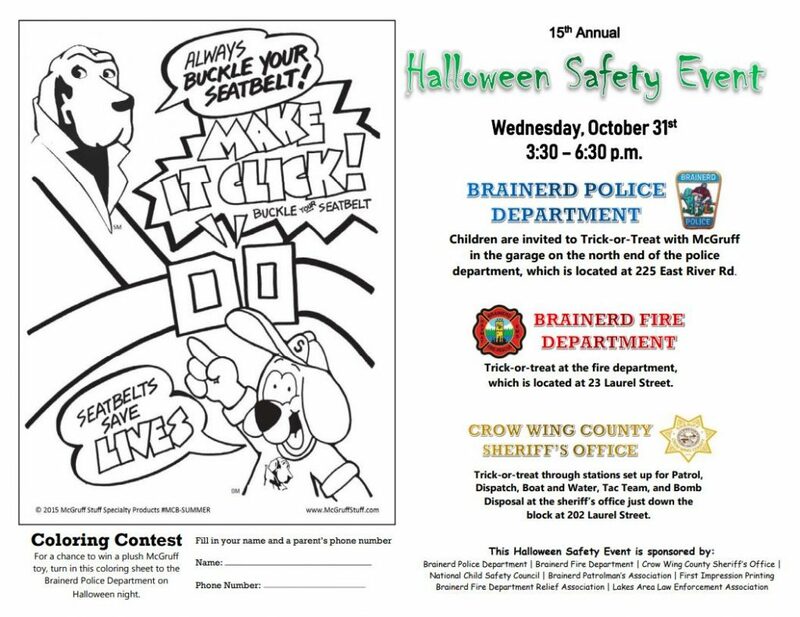 The Brainerd Fire Department and Crow Wing County Sheriff’s Office will also be participating in this Halloween Safety Event.